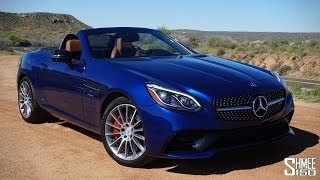 Mercedes is giving rounds of changes and upgrades to its entire lineup, in queue to same they recently shared the updated Mercedes-Benz SLC43 AMG 2017. Featuring more beefed up look and the upgrades provided by the engineers at AMG, the model doesn’t only looks muscular but also performs better and economical. Let us have a look at the review of Mercedes Benz SLC 43 AMG 2017 to know in details about the specifications and performance figures. Though there aren’t many changes made to the interior of Mercedes Benz SLC 43 AMG 2017 but yes it definitely has some notable differences that set it apart. The list of changes includes a new three-spoke Nappa leather wrapped multi function steering wheel hiding behind it a redesigned instrument cluster. The dashboard now has new AC vents featuring chrome trim finishing while the same essence can also be noticed over the door handles. There are also new seats that come wrapped in Nappa leather and Dinamica microfiber featuring contrast stitching and providing more lateral support. The interior of Mercedes Benz SLC 43 AMG 2017 isn’t just about comfort and control but it also brings better looks. The major change is with the ambience lighting in Solar Red, Polar Blue and Polar White while the Logic 7 Surround Sound system adds to the gleam. Just like the interior, the exterior of Mercedes Benz SLC 43 AMG 2017 comes with few yet notable changes. Starting with the front fascia it has a newly designed diamond pattern grille amidst the new set of headlights. Beneath the setup the bumper too gets a touch of aggression while the horizontal slats across the sides get larger in size. Moving towards the rear end, things get more aggressive. The unchanged trunk lid keeps its place while the LED tail lights are integrated with reverse lights at the bottom. Beneath this setup the bumper gets a new design and features vertical side intakes with a new diffuser and smaller exhaust pipes. In all the exterior of Mercedes Benz SLC 43 AMG 2017 looks amazingly aggressive rolling over its 18-inch AMG wheels. Beneath the hood of Mercedes Benz SLC 43 AMG 2017 is a new 3.0 liter V6 biturbo engine producing total output of 362 hp and peak torque of 520 nm paired to 9G- Tronic sport transmission. The model thus becomes the second one not coming with a V8/12 engine ad rather carries more economical engine. 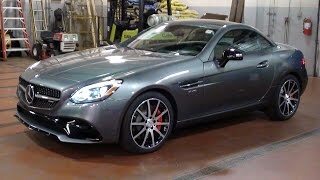 With this power the top speed of Mercedes Benz SLC 43 AMG 2017 touches the mark of 155 mph while the 0-60 mph sprint can be knocked in just 4.6 seconds.